Hi all. I'm desperate for bacon. I've been to about half a dozen places that are serving wacky new dishes with bacon, and all have come up short. The best so far was the bacon flatbread at Sepia, but it was not as it claimed: I tasted no peaches; it was covered in flavorless apples and the bacon was nearly raw, making the appetizer incredibly greasy. The flavor was great though and the bread was crisp. Please help me find a tasty dish that stars bacon in the Chicagoland area. The more affordable the better, I don't bring home enough bacon to support my bacon habit. Last edited by Pie Lady on November 10th, 2011, 2:51 pm, edited 1 time in total. First thing that comes to my mind is the liver 'n' bacon at Erie Cafe. Thick, thick slices of bacon. Almost like rectangular pieces of bacon steak. Not new, not cutting-edge creative, but the best BLT I've had in a long time can be found at GNR winner The Depot American Diner. The bacon ice cream at Blackbird is a great way to finish off a lunch of porcine delights - appetizer of confit of suckling pig followed by the pork belly sandwich. The bacon ice cream is served with a mission fig beignet, black rasperries and butterscotch sauce. Weeks after having the bacon ice cream all 3 of us that had it that day were still talking about it - in a good way. I'm sure you can pop in just for the dessert, though. Shouldn't this thread title be changed to Give Me Bacon And Give Me Death? For another BLT rec, Milk & Honey's triple decker BLT is fantastic. The Riverside Deli does some mean bacon as part of their broad brunch buffet on the weekends. It's probably the best stand-alone bacon I've had. I am also a big fan of the bacon at Alonti's, an overpriced chain of breakfast and lunch sandwiches downtown. I would either recommend a breakfast sandwich with bacon or the Big John's Club, which has a ton of bacon on it. Your best bet is to head over to Treasure Island and pick up some heaven in plastic packaging, Nueskes bacon. Just fry it up crispy in a pan and voila...crisp yummy bacon that might be more addictive than crack . It gets no better than this. Vosges now has a bacon-flavored chocolate bar. Yeah, talk about indulgence. 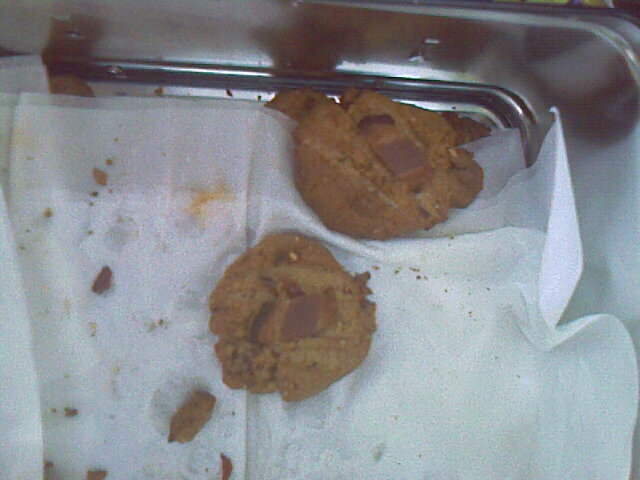 Death by bacon and chocolate! Kman wrote: The bacon ice cream at Blackbird is a great way to finish off a lunch of porcine delights - appetizer of confit of suckling pig followed by the pork belly sandwich. The bacon ice cream is served with a mission fig beignet, black rasperries and butterscotch sauce. I did try this in fact, and the bacon ice cream was fantastic, the sauce divine, and I liked the raspberries and figs thrown in. I was incredibly disappointed by the donuts, though, as they were just average sugar donuts, not beignets, and they were so small that all I tasted was a shot of sugar. The filled one was also too sweet and it tasted a lot like raspberry jelly, not fig. marias23 wrote: Vosges now has a bacon-flavored chocolate bar. Yeah, talk about indulgence. Death by bacon and chocolate! No kidding? I tried the maple-caramelized one at Coco Rouge and was not impressed; however, I love Vosges so I'll have to look for that. It sounds like it wold be great - chocolate + bacon should equal heaven. Oh Lord. I might have to go there today! aschie30 wrote: Shouldn't this thread title be changed to Give Me Bacon And Give Me Death? Considering the answers I'm getting (see the above post by nr706, especially), yes. But hopefully not before the pig goes extinct or the world explodes, whichever comes first. I have also had the 3-course bacon lunch at Blackbird...dee-lish! The GF and I went to the "Swine & Wine" dinner at Osteria via Stato earlier this month and it was also bacon heaven, most notably Adam Seger's "baconcello" cocktail, garnished with a crispy pancetta wheel. I went to a wine tasting this week at Crofton on Wells (Syrah & Swine hosted by Maverick Wine Co) and Suzy made all pork finger food to go with. Highlights were confit of pork tongue on quinoa-corn johnnycake with shallot jam, and pork kidneys with vol au vent, truffle hollandaise and crispy prosciutto in a puff pastry. As for Vosges, Katrina's "Mo's Bacon Bar" is the best bacon sweet I've ever tasted. And Da Beef is right, Nueskes bacon is the best bacon that I've cooked at home...to date. Please call a day or two ahead! It's an off-menu item, but Gus might or might not have the stuff on hand to make it. I hate to say it, but I just tried that drink, and it was hideous, and the bartender forgot my wheel. But the Blackbird lunch sounds fantastic. And that Eggs Benedict at Gioco's sounds like what heaven must taste like. Mmm, I just finished off another Vosges bacon bar a few minutes ago. It is really truly one of the best (if not the very best) candy bars I've ever had. Also, I had the Hungarian pork sausage at Doug's today, with bacon garlic mayonnaise. It was surprisingly (and pleasantly) bacony. I was at a Knob Creek tasting held at J-Bar and catered by DB's Primehouse earlier in the month. One of the passed apps was maple syrup glazed bacon with fresh black pepper. I don't know if it is on the actual menu at either place, but it was good and went well with the bourbon. Don't forget GNR Patty's Diner for straight-up bacon. Patty is very serious about cooking it properly. (Read crisp, evenly cooked, and flat). She even mentioned to me her astonishment that she found the bacon served in Las Vegas eateries to be poorly prepared. I didn't ask her about the portions (or the shrimp, for that matter). But I have enjoyed the BLT at Patty's. Why mess with a classic? Have Gus at The Wiener & Still Champion make you a "chicagostyledog" francheezie aka a "coronary dog"(wrap bacon around a hot dog, deep fry it, and smother it with melted Merkt's cheddar cheese). It's not on the menu and only prepared by Gus. Poster Figmolly is a caterer who makes bacon truffles. 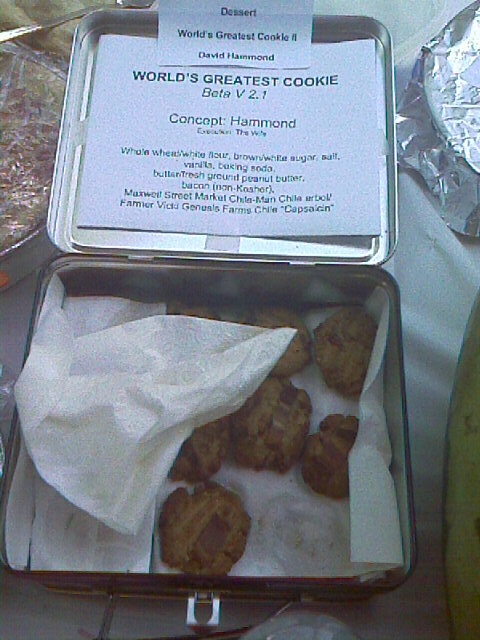 I have also seen bacon brittle, think peanut brittle with bacon substituting for the nuts! Last edited by Cathy2 on October 29th, 2007, 11:05 pm, edited 1 time in total. One of my favorites is the chorizo stuffed dates wrapped in bacon at Avec. Bacon dumplings at GNR winner Healthy Food! For a bacon bonus, get some bacon buns to take home. When pigs fly and bacon grows on trees! 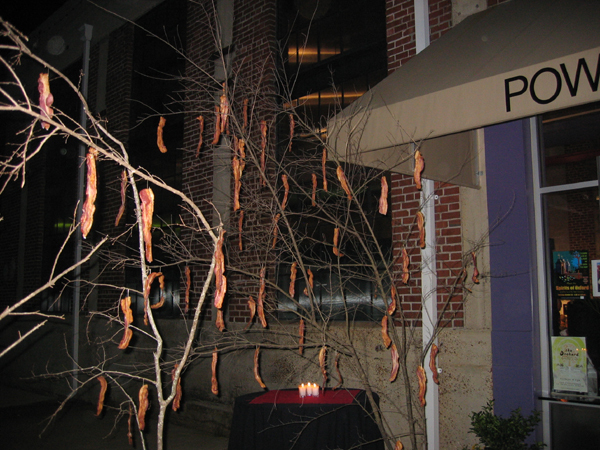 I was at a party where they had crisp bacon strips hanging on trees for guests to pull off and eat! Where does one get such things? Okay, just went to Sepia for brunch and had their bacon bloody mary - awesome! Bacon-infused vodka, housemade mix, and a bacon-wrapped cherry tomato garnish. And their eggs benedict with berkshire pork belly and honey mustard hollandaise is icing on the cake! 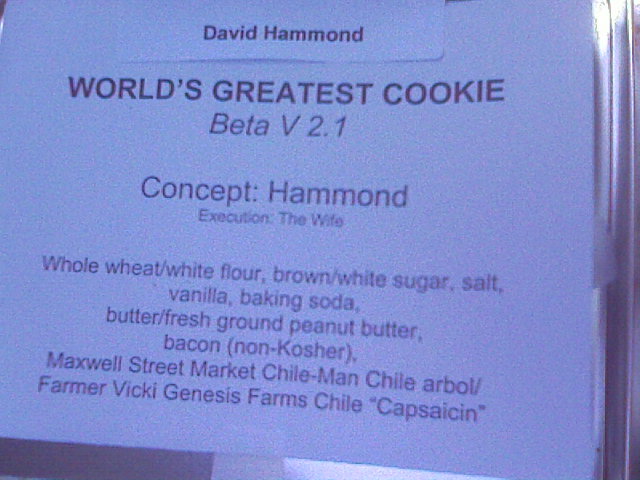 It just cracks me up that the ingredient list of the Hammond's cookies says "Bacon (non Kosher)" As if there was a kosher version of bacon. I have a recipe for bacon Baklava that is absolutely amazing. You use maple syrup and pecans along with the bacon. It's perfect for brunch. it's not quite bacon, but Moto has a chorizo margarita on their menu.